Capt. Dale Leverone dropped a whole squid to 1,200 feet while fishing off the famous Kona Coast when he hooked this amazingly beautiful fish. 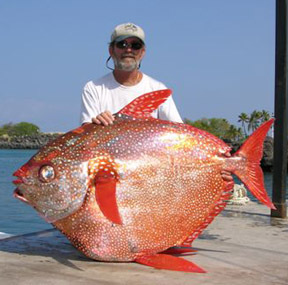 The opah matched Dale's Penn 130 tackle and 200-lb test line but was finally raised to boatside. Opah are reputed to grow to 6 feet in length and 600 lbs in size, so we're looking forward to seeing more of these big boys almost as much as Dale is looking forward to hooking one! By the way, opah's eating qualities are unsurpassed.